I have to admit it. This 10 Empties Challenge is hard. I want to buy stuff. I don't really NEED anything. But I WANT to buy stuff...bad. I have emptied 3 out of 10 products. My latest empties are the LipFusion Lip Conditioning Stick in clear and the Urban Decay 24/7 Glide-On Eye Pencil in Zero. I have plenty of lip glosses and chap-sticks so I won't buy the LipFusion stick again any time soon. The appeal of it for me was having a chap-stick that dispensed like a lipstick, that just always made it feel like it was cooler than your average chap stick. 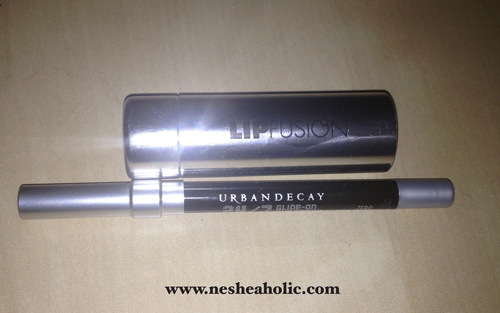 The Urban Decay eyeliner is one of the best eyeliners I've used. It went on very smoothly and lasted all day but was pretty easy to wash off at night. I do however have a lot of eyeliners, and just started using gel eyeliner which I really like, so I probably won't be re-purchasing this any time soon either. I use MicaBeauty gel eyeliner. The 10 empties challenge is BRUTAL. I'm currently 4 products in (technically 5 but I'm not sure if a box of hair dye counts since it's a one time only situation. Looks like I'll be updating the rules again if I plan on repeating this) and GAH. I've never wanted to shop so much in my life. Urban Decay's liners are so nice. Actually, I don't think I've ever been disappointed with any of their products. They're definitely one of my favorite brands.